One of the first people to make a very accurate measurement of the circumference of the Earth was Eratosthenes, a Greek philosopher who lived in Alexandria around 250B.C. He was told that on a certain day during the summer (June 21) in a town called Syene, which was 4900 stadia (1 stadia = 0.16 kilometers) to the south of Alexandria, the sunlight shown directly down the well shafts so that you could see all the way to the bottom. Eratosthenes knew that the sun was never quite high enough in the sky to see the bottom of wells in Alexandria and he was able to calculate that in fact it was about 7 degrees too low. Knowing that the sun was 7 degrees lower at its highpoint in Alexandria than in Syene and assuming that the sun's rays were parallel when they hit the Earth, Eratosthenes was able to calculate the circumference of the Earth using a simple proportion: C/4900 stadia = 360 degrees/ 7 degrees. This gives an answer of 252,000 stadia or 40,320 km, which is very close to today's measurements of 40,030 km. Collaborating group to the North or South of you. Contact a group of students, or anyone else who is willing to help you out, at a location far (at least several hundred miles) to the North or South of you. This experiment achieves the best results if your locations are at approximately the same longitude. Arrange a day to simultaneously conduct this experiment. If the weather becomes cloudy in one location you can postpone that half of the experiment for a day or two. 45 minutes or so before noon, set up the experiment outside at a flat location. Balance the new pencil on either end on the flat board. It might be difficult to balance the pencil on its end. If you cannot balance the pencil you may use a small bit of clay to hold the pencil in place. You may want to check that the pencil is completely vertical either by placing a carpenter's level on the board or by checking that both the top and bottom of the pencil are aligned with a weighted string or plumb bob. If you do not want to make marks on the board you may cover it with paper. Make sure the pencil's shadow is completely on the board. Mark on the board or paper the location of the bottom of the pencil. Make a mark on the board where the end of the pencil's shadow falls. Make a mark every 5 or 10 minutes from 11:30 a.m. to 12:30 p.m.
Record the length of the shortest shadow and discard any other measurements. From a road atlas or online-directions service (http://www.Mapquest.com) determine the distance between the two locations of the experimenters. Draw a circle of at least 10 inches in diameter on a large blank piece of paper. Also draw on this circle a radial line (from the center to the edge) which goes beyond the edge of the circle about 3 inches. On a separate piece of paper, draw a scale diagram of each pencil and its shadow, choosing a scale in which the height of the pencil is about 4 times as large as its scaled height. Draw the pencil and its shadow so that they form a right angle. Cut out the two right triangles of paper that you have just drawn. Place one of the paper triangles so that its pencil side (you may want to label it P) continues the line you drew on the circle and its shadow side is lined up as closely as possible along the edge of the circle. See diagram below. Draw a line on the large sheet of paper that extends the hypotenuse of this triangle. This represents the light from the sun coming in hitting the tip of the pencil and forming a shadow. Now place the paper triangle on the edge of the circle so that its hypotenuse is parallel with the first triangle, its shadow side is aligned with the edge of the circle and the pencil side points directly out from the center of the circle. The hypotenuse of each triangle needs to be parallel with the hypotenuse of the other because the light rays from the Sun are assumed to be parallel since the Sun is so far away from the Earth. See diagram below. Draw a line from this triangle's P side to the center of the circle. Measure the angle created at the center of the circle between the two extensions of the P sides of the paper triangles. This will give you the difference in latitude between the locations of your two measurements. You could easily look up the latitudes of your locations online or in an atlas, but Eratosthenes didn't have an atlas, so we will pretend that we don't eeither. Now, perform calculations to get the circumference of the Earth. Look up the currently accepted value of the radius of the Earth and compare your answer. Describe factors that might cause any difference you observe between values. Possible explanations include measurement error, a pencil which was placed on a slight hill, or the fact that the Earth is not a perfect sphere and is instead an ellipsoid which does not have a constant radius. Oftentimes, schoolchildren are taught that Christopher Columbus met with opposition when planning his trip around the world because people believed the Earth was flat. Actually, many people knew at that time that the Earth was indeed round; the real confusion lay in determining exactly how big the Earth was and whether or not he should risk the trip. 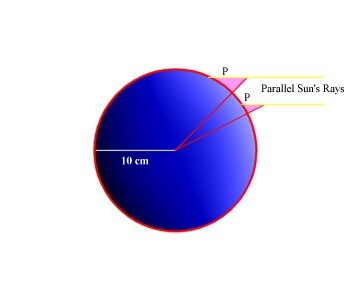 The reason for the confusion appears to be that an error was made converting the result of Eratosthenes' experiment (described above) into more modern units of distance measurement, which you can read about at http://www.youth.net/eratosthenes/welcome.html.